Do you visit a lot of the same web sites over and over again? Some examples may include line of business applications, banking, tax sites, etc. Many people rely on browser "history" to find web sites when you need them...just start typing the address and Internet Explorer will try to complete it for you. This usually works well, but the more organized way to memorize these sites is to use "Favorites". 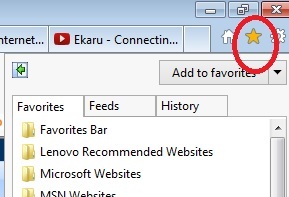 To access "Favorites" in Internet Explorer, look for the gold star in the upper right hand corner. Clicking this icon will open up the "Favorites" section where you view your existing favorites, and organize in folders as needed (if you have a lot of favorites). To add a site to Favorites, browse to the site your interested in, and then click "Add to Favorites". You can then name the site so you can find it easily next time, without remembering the entire URL. Click "Add" to save the site. Next time you want to access the site, simply select it from your list of favorites. 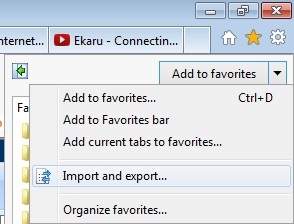 A big advantage of using the Favorites tool to organize your sites is that if you get a new computer, you can simply transfer this entire folder to your new system so you don't have to recall all your frequently used sites. In Windows 7, to find your favorites folder (so you can copy it as needed to a new system, or make sure its being backed up), go to C:\Users\userName\Favorites (where "userName" is your actual user name). You can copy this to your new system, and then simply import it into favorites again. This will save you a lot of time getting started on the new system. On this menu, there is also an option to Organize Favorites, where you can create new folders, move favorites, rename favorites, and delete as needed. Take a few moments to get organized, and you'll save a lot of time in the future!